I think it is a good possibility that the robe that Mona Lisa was wearing in the famous painting by Leonardo da Vinci had a hood. There is something so enigmatic about a hood. You have the opportunity to be extra mysterious, scandalous or maybe a little introverted. Maybe that is what she is trying to hide with her smile? Personally, I love a good hoodie. 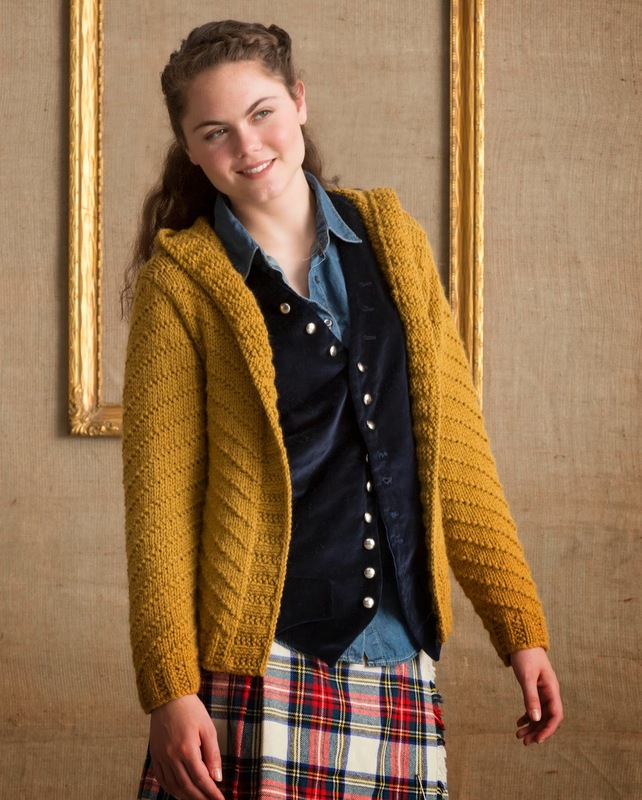 And the hoodie on the Mona Lisa cardigan is just one of the many reasons I love this pattern from our newest book, Portraits. 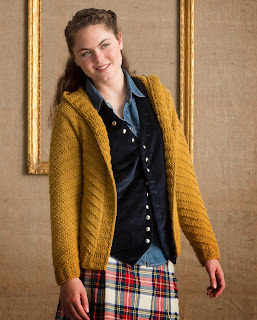 The cardigan is knit in Wynter, a bulky alpaca and wool blend. The stitch definition on this yarn really makes the diagonal pattern that Tonia Barry used in this design pop. I really love the way that she changed direction of the stitch at the center back to make a V-shape, which is echoed at the side seams and on the hood. In addition to the cardigan, there is a pullover version of this sweater knit in Blackthorn (did you know that Blackthorn and Wynter are interchangeable? Blackthorn is part of our MountainTop Collection of natural yarns and is the same base as Wynter.) The pullover features a flattering neckline and is also a great layering piece. 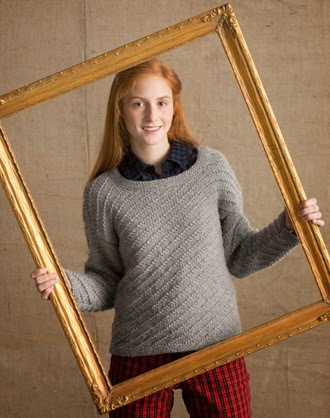 Whether you choose to knit the pullover or the cardigan version of this sweater, you are sure to love it. The stitch pattern gives this simple silhouette a little extra flair, without making it too difficult. Knit at a bulky gauge, it will go fast and keep you (or the lucky recipient of the FO) toasty this winter. Check your LYS for a copy of Portraits, there are lots of great designs in this book that are in bulky yarns…so you’ll be sure to whip them up in no time! I really had a great time with your post!http://www.promptessay.com I am looking forward to read more blog post regarding this! Well written! Great post, I enjoyed ready reading it, (www masterpapers com) Keep posting good stuff like this. Very nice post. I just stumbled upon your blog and wanted to say that online-essay-writer.org I’ve truly enjoyed surfing around your blog posts. I actually do reverence an important stength, beyond the significance of many of us triggered how many years to publish this web site, you've got an opportunity to work and also plain and simple smoke enthusiast noises. Since the content you are simply because from the website own it however similar of the local community, in place of conclude to be able to satisfaction us making time for ahead.